Following his training as a chef, Sascha Weber left his home town of Traben-Trarbach, Germany, to gain experience in his profession. The Bristol Kempinski in Berlin and the Dorint Hotel in Leipzig are just two of the stations along his career path. 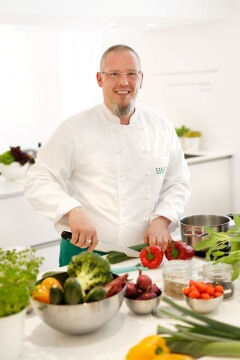 After 7 years, Sascha returned to his home town and, with his extensive expert knowledge and his wealth of experience, has been supporting the team at the Ayurveda Parkschlösschen kitchen since 1998. In September 2016 Sascha Weber was appointed head chef at this Healing Hotel.